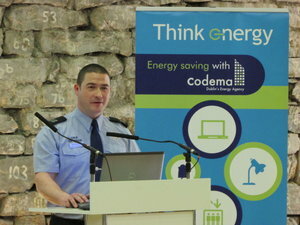 Dublin City Council and Codema have successfully launched the first Think Energy Ambassador Programme with over 20 staff members of Dublin City Council volunteering to become Energy Ambassadors for their building or office. While trying to identify energy saving opportunities in their own area, Think Energy Ambassadors will receive training on energy issues and will get involved in the shaping of the energy awareness campaign. 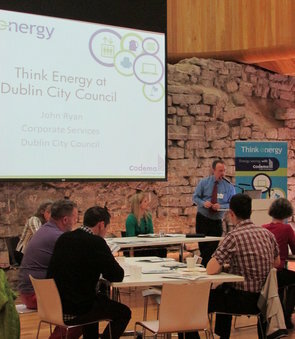 The group of Think Energy Ambassadors was welcomed by John Ryan (Corporate Services, Dublin City Council), who highlighted the need for the Council to lead by example. He also introduced the Think Energy Team and thanked staff for their commitment. Joe Hayden (Executive Energy Engineer, Codema) provided some background knowledge on why saving energy is important for Ireland, looking at the energy mix of Ireland and its fuel dependency. The presentation was followed by Codema's Marketing Officer Verena Brennan, who explained how Think Energy started and how the Energy Ambassadors could get involved in the campaign. Nifes consultant Marion Beaver facilitated a group exercise which asked participants to look at the Energy People's Matrix for their company and get them thinking about barriers and opportunities for a successful energy awareness campaign. Finally, the Think Energy Ambassadors were left with an inspirational talk from fire fighter Neil McCabe (Dublin Fire Brigade). Highlighting the importance of stakeholder buy-in, Neil has initiated numerous actions at Kilbarrack Fire Station to make it the first carbon-neutral fire station in the world. He presented the 7 themes of his Green Plan which is available for download on the Think Energy Online Hub.